A pleasant surprise after a long train journey through the endless taiga, Khabarovsk boasts a picturesque location, some of the area’s best museums and wide boulevards lined with gorgeous Imperial-era buildings. Located at the confluence of the Amur and Ussuri rivers, Khabarovsk (6140 kilometers from Moscow) is the second largest city in the Russian Far East after Vladivostok. Having grown from a small military post in the middle of the 19th century, the city got its name from the famous Russian explorer Yerofei Khabarov, who surveyed the Amur River. Currently Khabarovsk is the administrative center of the Far Eastern Federal District. The city was founded by Count Nikolai Muravyov-Amursky and the main street is named in his honor. Modern buildings and shopping centers coexist with old stone houses of gray and red. A monument to this famous Russian statesman can be found in the city’s Central Park. This statue can also be seen on the 5,000-ruble banknote. The best way to explore Khabarovsk is on foot, beginning at Lenin Square and working your way towards the banks of the Amur River. The two main boulevards, Amursky and Ussuriisky, run parallel to each other. The architecture on Lenin and Serysheva streets, with its mostly Stalin-era structures, differs from the beautiful pre-revolutionary buildings on ul. Muravieva-Amurskogo. The Amursky and Ussuriisky boulevards did not exist until the mid-1960s. Khabarovsk is not a typical Russian city along the Trans-Siberian Railway. The unusual fusion of Russian and Chinese cultures is felt in the food, culture and even lifestyle of its residents. Japanese touches complement this picture in the form of blossoming cherry trees and cars with steering wheels on the right hand side. That Khabarovsk has such a strong Asian influence should not seem surprising, as the city is located only 17 kilometers from the state border with China. The nearest Chinese settlement, Fuyuan, is 65 kilometers down the river from Khabarovsk. Khabarovsk’s gem is its picturesque river embankment and the Amursky rail and road bridge, which is also depicted on the 5,000-ruble banknote. Just like the Eiffel Tower, this bridge won the gold medal of the World Exhibition in Paris in the early 20th century. Khabarovsk became famous during the Soviet period for a popular song about border guards that stand on the "high banks of the Amur" and protect the motherland. It is not hard to find old cannons on display in the city that were fired during the Russo-Japanese War. At the present time Khabarovsk is the headquarters of Russia’s Far Eastern Military District. The Military Historical Museum of the Far Eastern Military District depicts in great detail everything you ever wanted to know about the formation and development of the army in the Far East. Models of weapons from different years are exhibited over the museum’s 13 halls and heavy military equipment is placed in the courtyard of an observation deck. The museum itself is located in a historic building right on the bank of the Amur River. The Far Eastern Art Museum, also known as the "Far East Tretyakov Gallery" features original works of ancient Russian art, as well as local artists from the Amur Region. Among the artists on display are Ivan Aivazovsky, Ivan Shishkin, Ilya Repin, Vasily Surikov, Isaak Levitan, Alexander Benois, Apollinaris Vasnetsov and Mikhail Vrubel. Many of these works of art came to the Far East from museums in Moscow and St. Petersburg. The Khabarovsk Regional Museum holds collections of flora and fauna, ethnography exhibits of indigenous peoples and Slavic settlers, and displays by paleontologists and geologists that tell the city’s story from its foundation. The only archaeological museum in the Far East is the Okladnikov Museum, which features 120,000 ancient artifacts pertaining to the Amur Region. For those traveling with children, Khabarovsk has special kid-friendly attractions including an aquarium featuring fresh water fish of the Amur River basin, as well as the Gaidar Amusement Park and the Khabarovsk State Circus. A living museum of Far Eastern flora can be found at the Khabarovsk Arboretum, established as an experimental laboratory in 1896. It has collected about 300 plant species that grow in the Ussuri taiga as well as those from the Himalayas, Central Asia and North America. Khabarovsk is known for its parks such as Dynamo or Yuri Gagarin Park. The Central Park of Culture and Relaxation is perfect for taking leisurely strolls and leads to the river station located within the park, where you can take a boat ride on the Amur River. Especially memorable is taking a walk along the river at night, when Khabarovsk is illuminated by hundreds of colored lights. In the park there is also an observation deck that offers a spectacular view of the Amur. The oldest Orthodox Church in Khabarovsk is a Church of St. Innocentius of Irkutsk, erected in 1870 in honor of the patron saint of Siberia and the Far East. The impressive Holy Transfiguration Cathedral (its height with golden domes is 95 meters), built from the donations of inhabitants of the region, is the third largest temple in Russia after Moscow's Christ the Savior Cathedral and St. Isaac's Cathedral in St. Petersburg. 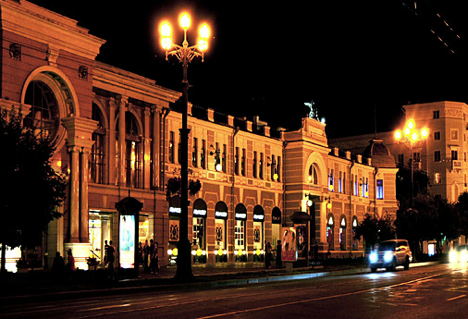 Several major theaters operate in Khabarovsk, which is often called the cultural center of the Far East. These include the Khabarovsk Regional Musical Theater performing classic operetta and musical comedy, and the Regional Drama Theatre featuring international and domestic classics. There is also the Triad professional mime theater, which offers unusual performances in interesting interiors. Khabarovsk is hot and humid in the summer with temperatures reaching 30 C and cold and dry in the winter with the average temperature being -24 C. However, the temperatures often drop below -30, making Khabarovsk the coldest city with a population of 500,000 or more in the world. There are massive ice sculptures on Lenin Square from January until the spring thaw in April as part of the annual Amur Crystal and Ice Fantasy festivals. City Day, celebrated on the last Saturday of May, is a good reason to visit Khabarovsk at the beginning of summer. No matter the season, if it is clear, then climb the Khabarovsk cliff (ul. Shevchenko 15), a true symbol of the city. A famous building was constructed here on a rocky promontory 70 years ago by an architect named Starikov. At first it was a station for military observation, later becoming a rescue station. After the building was transferred to Khabarovsk Central Park of Culture and Recreation, a viewing platform was added that now offers the best panoramic views of the Amur River. Take a selfie here with a view of the Amur River at the monument to Count Muravyov-Amursky.